Unwittingly some of my SWX files got deleted in my external HD. Is there any effective data recovery software to recover? I saved in two locations but didn’t update it. Deleted folder has 135 files whereas same but not updated folder has 91 files. But it has been years. There are other tools out there, too. If this is production data, I'd take more steps. Depending on how important the data is you can send the drive off to a data recovery company. If it is important, but you don't want to spend the money, I'd use a good Linux distro and image the drive to another drive and work off the copy to restore your data. Oh I forgot to mention, do not write anything to the drive. Your data is still there after you delete files. The only thing that gets changed is the pointers (FAT). So, unplug the drive if you haven't already done so and leave it unplugged until you attempt the data recovery. If you didn't write to the drive there is a good chance you can recover at least some of the data, maybe even most of it. I have done this a number of times. That's funny Jim! Actually, mostly it was for camera cards and pictures off of drives. And unsurprisingly that is what Recuva and the other tools focus their tools. However, those tools will recover other file types, too. One of the instances, one of my coworkers/friends had a HD fail to boot. Well, he had some family photos that weren't backed up. I used the Linux photrec tool to get most, if not all of those pics back for him and his wife. You did notice I used the term US? Interesting, I haven't thought of using that for SD cards. It is very common for people to format camera cards before downloading the photos. I did a google search. There are many software in the market but I do not know which one is good. Is there any way to save a file in two locations? That means one mouse click save the file in two locations and other location should be outside the computer. So that if you reformatted the HD, files in other location remain intact. I forgot about that. I had so much trouble with Auto recover, I turned it off. Also, there were serious issues in 2017 with Auto recover. I think they fixed it in sp3 or sp4. If I use this backup feature, if I send a SWX file to recycle bin what will happen? Such file in the 2nd location will remain intact or go to garbage? Short answer to your question, is yes. Though, I don't have any current experience with any of the backup software you are asking about. The problem with the above link is that it includes HD cloning software in the list, and that is not what you would use for "backups". I had played with Cobian (years ago), and it would copy changed files from the directories you selected to another location at times you specified. I am in no way suggesting that software for production use, just stating that is what it does and that is the type of software you appear to be asking about. Recovery not really, we use backup maker every nite. It backs up partial hard drive for 2 weeks and does the full hard drive every 2 weeks. Purges data after 3 weeks. Has worked really well. The worst you have to deal with is loss of 1 days worth of work. The software is relatively inexpensive I think it was like $30 which is cheap compared to lost time access to information. That is about what we do but a full backup each night. So I only lose what I screwed up that day. So far have only deleted a folder I needed once in 3 years. But it was nice just asking my IT guy to please return it. The partial backup only zips up the files that have changed from the previous backup, which keeps the run time on the software down. Since I head the design department and do the IT work I want simple. It e-mails me a word document of all of the files that were backed up the night before. On the partial backups it is easy to see if there is a part or something that should not have changed, which gives me a heads up to check the models for that project to make sure we are not going to have an issue with that projects parts. Since we do not use PDM the write protect is what we use once a project is signed off on. Not sure if you can do it by yourself unless you're a computer geek ! As long as I have seen in the google search Recovery software are around $100. But "data recover service" is for companies I don’t know how much they will charge. Not sure what you mean "for companies"
What I mean is if they charge around software cost then I can a software. 1. Send the HD to a company that will recover your files for you. 2. Try to recover the files yourself, either using free tools or a tool you purchase. I believe Christian Chu, is recommending you do 1. Which is the best option. But, often times it is too expensive. So, you have to answer the question, of how much is that data worth to you, vs. trying option 2. Do you have link of the free software? You could try this one here by Piriform who make Ccleaner. I am looking for free data recovery software. In your link no longer free data recovery software is available. Only free system clean up software is available. They just don't offer support for it. I understand you are looking for free, But this is my recommendation. ReclaiMe data recovery. It is not free, My trouble with the free ones, would not recover what I was trying to get back. This recovery software works great. It may not be fast, but it can find a lot, even off corrupted drives. I have owned it for 2 years, and have recovered a lot of lost data with it. This is my first time I lost data unwittingly. Therefore buying a software is not worth for me because I am not going to use it in the near future. Even though I also suggested Recuva, it is important that you run the download through something like virustotal.com before installing it. Piriform (maker of Recuva and Ccleaner) had a version of Ccleaner out there that was infected with malware. I didn't follow-up on it, and I don't think it was intentional, but it did apparently happen. I have McAfee internet security. Every software I download, it automatically scan. I also manually scan second time before installing it. I assume that antivirus software that you pay does not do anything to damage their name in the market. Is there any way to find out whether McAfee has the malware signature in it database? I'm guess you could launch McAffee...Virus software generally tells you whether the database is up to date. But my point wasn't just about whether the DB is up to date, but what if McAffee isn't even aware of a malware out there? That is why I like to run files I download from the internet through virustotal, it runs the file through 60 different antivirus/malware engines, including McAffee...Sounds like good insurance to me. My case was bit different. I decided to reformat my computer HD. I had two external HD connected to my computer. One HD drive had back up files in it, other HD was empty. Meanwhile I downloaded Windows10 from Microsoft site it was intended to be downloaded in the empty external HD but it was unwittingly downloaded in the back up HD. What it did was it formatted back up HD (as a result 1 TB was reduced to 32 GB) and downloaded. This was the reason I lost all backup files. If you overwrote the files with Windows installation files, then Recuva or some of the other consumer level tools are going to have a hard time recovering your SWX files. Christian Chu's suggestion of sending the drive off to a professional is much more likely to be the best solution to get your data back. Unfortunately, the task of recovery becomes much more complex when the data is overwritten...But it can be done, it is just difficult/expensive. I created a new recovery folder on my desktop to save the recovered files. But this message pops up. How to fix this? Is there any issues in saving recovered files in the same files lost HD? I believe you have to have more space available to restore to than the size of the drive you are scanning, otherwise it may not fit if it was full of data. Is there any issues in saving recovered files in the same files lost HD, that means HD I used to scan for lost files because that HD is 1 TB capacity? I can forego some of files and make it space needed less than 1 TB. I would not save files back to the drive from which you are restoring your files. What if Recuva doesn't find all your files and you want to use another tool? Get another external HD if your PC HD isn't big enough. Amazon.com: Toshiba Canvio Basics 2TB Portable Hard Drive - Black (HDTB320XK3CA): Computers & Accessories for $75 should work, if you don't have a spare one. It has been a while sense I looked into it. Have they done some reliability ratings on HD recently showing WD and Seagate drives being more reliable? Edit to add: I put those links in and screen kept jumping on me. I think it makes a difference in reliability which model you choose. And according to the top link Toshiba is right in the middle of the pack with some of their drives (they may have had some models that weren't tested). Both WD and Seagate have models that don't fare so well, but they've also have some models that perform pretty well. EDIT: seems like it's time to switch to different HD brand ! Years ago I had one of those IBM Deskstar drives... It worked fine for me, but not so well for others. It had such a poor reputation that people referred to them as Deathstars... So, I was perpetually worried I would lose data with that drive, that I started paying attention to reliability. I've had a good run of luck with HD's (knock on wood) that I haven't been paying as much attention. I never used DeskStar and a quick search tells me it's not a reliable one !!! No, I'm not saying that... Just may want to pay attention to which model from which manufacturer, and make sure you are getting a reliable one... 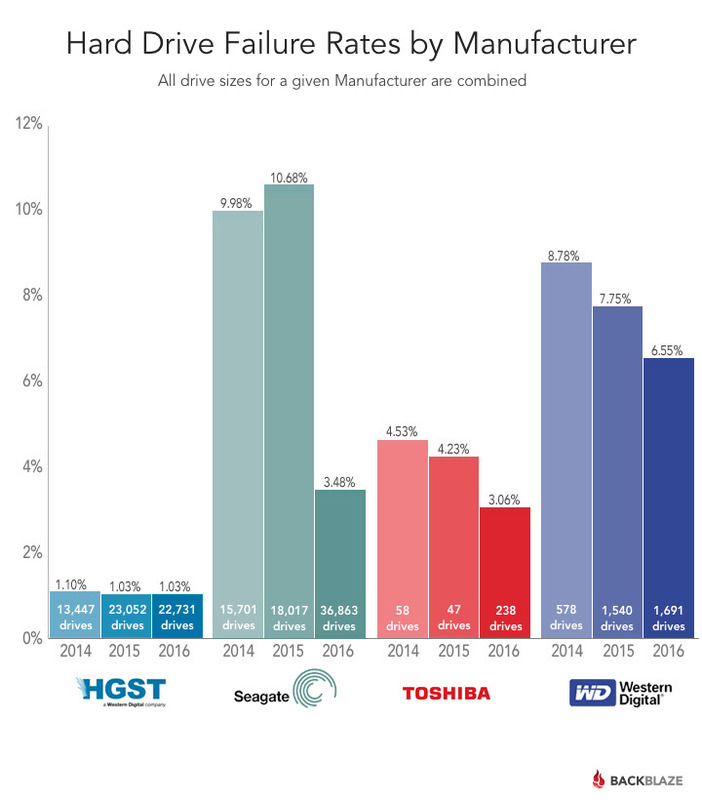 But it does appear that Backblaze is having really good luck with the models they have chosen from HGST. And you have to keep in mind that these HD's are in servers running usually full bore all the time. So, that failure rate you may see at 8% isn't what you or I may experience. Is there an electronics store nearby (Staples, etc.) where you can readily get an external USB hard drive? They're fairly cheap and in the TB range. and they come ready to go. They're so cheap and ubiquitous perhaps a neighbor or colleague has one at home you may borrow. This is location dependent obviously, but they're here in Victor Tango, so perhaps there, too. It's like how Bill Gates spends all his $$$$ - charity ! He knows that he can't take his money to his tomb. ya an the told me there was no way id fill up a 10mb when I bought the first computer...sales guys have no idea. Eggs in a basket. Bigger basket, more eggs. Bigger mess when it breaks. I hope that you're not the individual cloning, scanning, maintaining, restoring, recovering, optimizing, indexing, defragmenting, encrypting, or troubleshooting a drive that large. Start task and go for lunch, not just grab a coffee. I pity your tech support (theoretically, not personally). Regardless of microwave vs heat in writing methods, this would be relegated as useful for a shelved / off-site backup of other smaller, useful, managed active drives. I believe it's not about more files but bigger size ! Hi, here is a list of data recovery software for Mac and Windows including free ones, you can choose one of them: Top 10 Best Free Data Recovery Software Of 2017. Hope it would help. I have Recuva - Restore deleted files, even if you've emptied the Recycle bin! - Piriform installed. Unfortunately, without it already installed, there's a chance the installation will overwrite the files that are marked for deletion that you want back, if installed on the same drive. Your situation sounds like it's on a separate spindle, but just sayin' for the others in the listening area: install it before you need it. Unfortunately I had the need to use Recuva - Restore deleted files, even if you've emptied the Recycle bin! - Piriform about a year ago. It worked exactly as I needed it to and absolutely saved me a world of heartache! Thoroughly recommend having this already installed on any system just as Kevin has mentioned above. You just never know when you may need it! With improvements to NTFS and disk speeds, etc., defragging maintenance has dropped off the collective radar, but if you have a drive you wish to investigate for scattered bits, Defraggler is excellent software. When done analyzing, it will display a map of what it found and you can choose to defrag or not. As I said, defrag is kind of passe and Piriform hasn't released a new version in many years, but despite being long in the tooth, it's well done software. Use this one all the time to get rid of the various nothing files Windows leaves scattered all over the place. You can clean out cookies too, but there's a list you can build of cookies you wish to keep and these will remain whenever CrapCleaner does its business. You can easily remove them from the list too. You can clean the Registry too, but I don't. I just let the Registry keep bloating. Too chicken. Or too wise. Or too wise of a chicken. But you can use this feature to back up your entire Registry to a dotreg file with an automatic timestamp file name and a default save to the CrapCleaner folder in your My Docs (instead of using regedit, which some users may be prevented from running). It also has a feature similar to Autoruns for Windows - Windows Sysinternals , but I'd use Autoruns first. It has a few other features you may find useful, but I'll leave you to investigate further if you're so inclined. CrapCleaner is also available as an Android app: CCleaner - Android Apps on Google Play , but how well it compares to its Windows cousin or against its Android "Similars", I do not know. On the first run, CrapCleaner may chug along for a while as it hoes out your accumulated mountain range of crap. Subsequent runs are quick (if regular) since it's just cleaning up little mounds. CrapCleaner is the original name, but apparently, in our dystopia, "crap" is double plus ungood. So "rap" was snipped off and tossed into a Memory Hole, leaving us with our present-day, plus good, "CCleaner". However, for those of us who have been using this for years, whenever written or spoken of, out of respect and defiance, this software is always referred to as "CrapCleaner". Please honor and keep this tradition. Very good points! I haven't used either of those tools in years. But when I did they worked great. I used to have Defraggler run every Tuesday night. But, as you stated, we've moved to SSDs and I've read that you really shouldn't run a defragger on SSDs. I may look into CCleaner again thanks to your suggestion. Also, did you see my post about some of Piriform's software having malware inserted in it? You may have a look at: Hackers hid malware in CCleaner software - The Verge. It wasn't intentional on Piriform's part. But, if you have version of CCleaner 5.33 installed, you may want to have a look at some malware cleaners. Thank you for the link, I hadn't heard about this. But it's not surprising considering CrapCleaner's broad base of fans. I update fairly regularly and I'm at 5.38.xxxx, but I don't know if I updated with that version or if I skipped over it (unintentionally) and it was removed on a later version. Dunno, if I got infested, but the screen shot on the source (http://blog.talosintelligence.com/2017/09/avast-distributes-malware.html ) shows a 32-bit version. And the article states it's the 32-bit, but ti it comes with the installer. Also, I have CCleaner.exe and CCleaner64.exe in program files, so even if you're 64-bit, everyone gets the 32-bit in the distribution. I agree with not defragging SSDs. They have a limited amount of writes before they go belly up, so why waste them and with a SSD so smokin' fast, I don't think you'd perceive any defrag improvements. Just as a matter of interest Kevin, when you talk about limited writes to SSD's does anyone actually know what the approximate number is, or life expectancy? Surely the amount would exceed any normal rotation of buying a new PC with a new drive in it? Probably a recurring mindset I'm maintaining from the earlier days of SSDs. I'm sure you know life depends on data write volume and recurrance. But since there's also a max write count limit, when I see under Windows' hood at so much stuff running, I always wonder if you'd smoke an SSD just by Windows' constant doodling. It mentions life goes down with increased SSD throughput rates (faster units) and with more data written (larger files). So, perhaps some of the reliability advances that improved drive life over the years have been somewhat eroded by our speed addiction and our data file obesity. Maybe you must change the jumpers of your HD and gave it as slave, connect to another PC and recover all the data as you need it. Don't install nothing because you will overwrite all the data what you want to restore it. What is that jumper? There is nothing on my HD. It's for mechanical Hard Disk Drives. And that my friend is the key tip! Don't do anything that will overwrite or should I say 'write' to your hard drive before you recover. There is a data recovery software "IGEO Undelete" which recovers all deleted files. This software has one big advantage. It recovers files up to 512 KB for free.